The unveiling of Warhammer: Age of Sigmar was an uneven experience. Some elements were good, others not so good. Overall it was definitely better than Lawnmower Man. As is often the case with hot-headed hobby enthusiasts (AKA humans), there was a tendency to throw the baby out with the bathwater. Those that did may have missed some of the highlights. 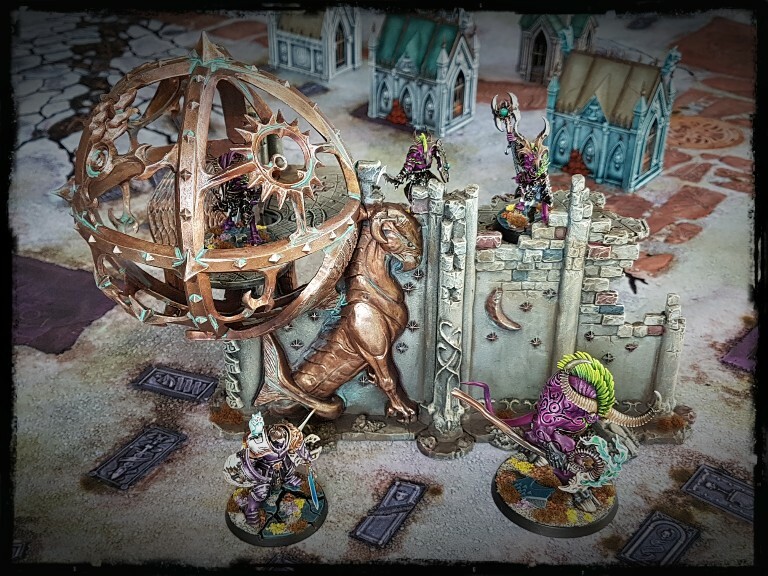 Like the Realmgates, the Numinous Occulum is one of the visual highlights of the early Age of Sigmar releases for me. 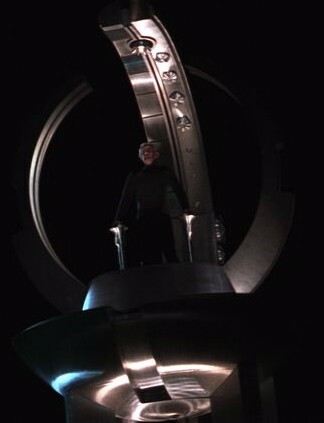 Standing in the centre of a large, spinning gyroscope has a history of connection with pseudoscience and/or magic in fiction. 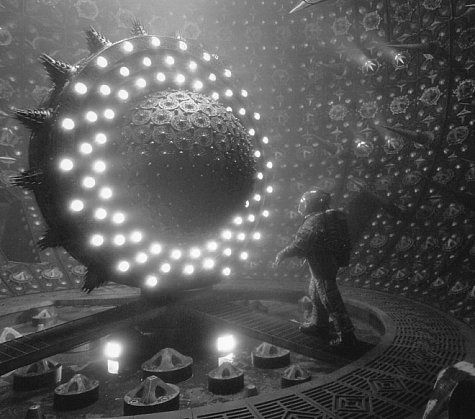 Im not entirely sure why being at the centre of a rotating sphere is storytelling shorthand for extraordinary power, but I dont make the rules. 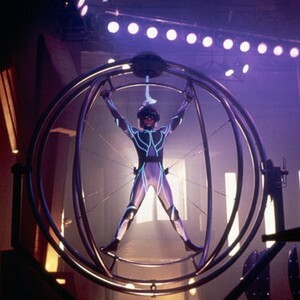 I suspect might be connected with the Vitruvian Man, but I dont have any evidence to back that theory up. 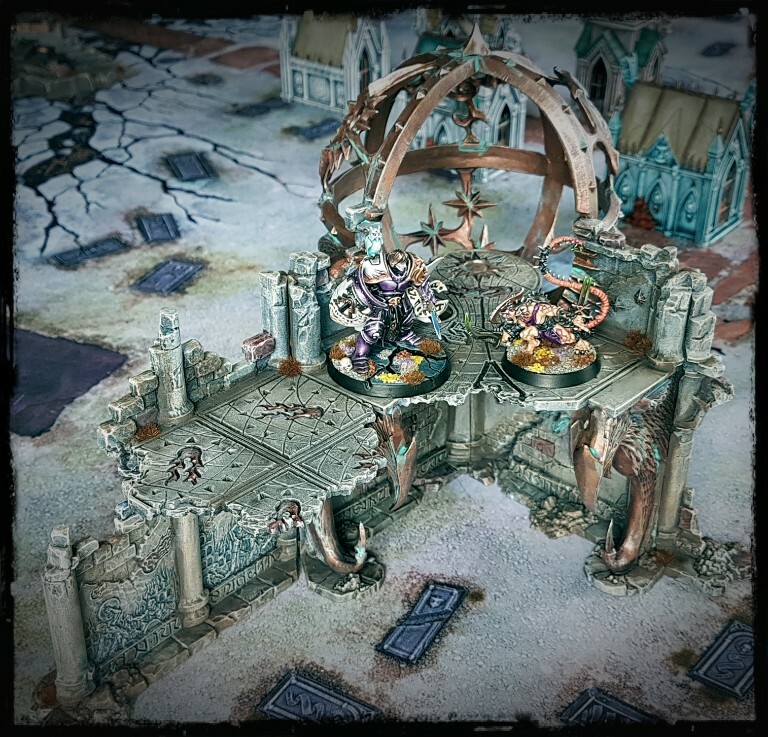 In Age of Sigmar, the Mysterious Landscapes rules can be used to generate a random in-game effects for terrain pieces, but specific Citadel terrain pieces like the Occulum are supplied with their own. As might be expected, the Occulum enhances the magical powers of those around it. The piece was painted with fairly rapid techniques so as to match the rest of the Exactamundo terrain. The bronze/copper/unobtanium on the model looks a little flatter in the images than in reality to be fair, but it was a simple job. The torturous process of degentrification of Exactamundo continues next time. Another mighty piece that looks pretty fab on the table. These AoS terrain pieces should be on most fantasy player’s radar. They feed into so many tropes. Conan, Elric, AD&D, Game of Thrones, Middle Earth… they fit into all of those as far as I am concerned. I’m glad that you like it Mr S! I’ve played on a number of these, and I find them surprisingly great – there’s loads of flat even surfaces to position models on allowing you to pack it densely with troops combats. I like the splashes of verdigris you’ve stuck on it. It brings it to life. 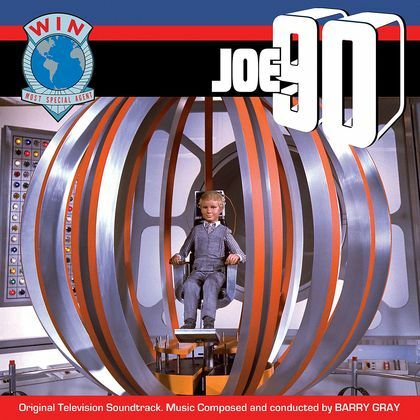 I particularly enjoyed this blog as it references Joe 90. And has good correct possessive apostrophe usage. My wife tried to get me to apostrophise for decades, but it was your good natured nagging that finally made me do it. Perhaps I should have married you? The large flat areas are as you describe Curis: big enough to accommodate various miniature fracas. It’s very practical while also looking ostentatiously decorative, which is ideal really. Great addition mate, fits in perfectly! I should have taken more street scene photos to illustrate how nicely the Osgilliath pieces fit in with these. Nice Occulum! I like the stone colours that you use. Looks really good. How was your experience putting the thing together? I found it quite horrible. The kit was not engineered terribly well. I found it easiest to approach the build quite slowly, in modular elements. I still had to fudge the assembly here and there, including using bits of sprue to reinforce the sturdiness of the floor. I also ran a fair bit of poly cement into the composite elements to make sure that it was sturdy. So in short it didn’t go together nearly as well as it should have, but it wasn’t a massive headache. It’s a good thing that it is a ruin though. A complete building like this would simply not have worked. The fitting of the separate piece were abyssal on my kit. I could actually see through parts when I put them together. Luckily I had both Liquid and regular Green Stuff at hand. The quality control of these Chinese kit is just too low. Thank you for opening my eyes to this gem. I am a late bloomer with aos. Probably one of the enthusiasts you mention. Anette did my comment got? Wonderful creation. I wish I has been more attentive. Silly, dumb, weird…and lovely! Good call, and the idea of a piece of technomagical machinery rusting (or oxidizing, to be accurate) away in the middle of a ruined city is extremely pleasing. The terrain mines several tropes really, making it suitable for anything from Hellboy to Helsreach to… somethingfantasythatstartswithHel. Helsinki? Well thought-out project, this one. Fantasy, pulp, horror, steampunk…you name it, it fits. The obvious scenario variation that I wanted covered was the pulpy Inquisitorial search for an ancient alien relic unspeakable power (not unlike the start of Guardians of the Galaxy. A few of the jungle trees mixed in should do the trick there nicely. I think this is the only piece of GW terrain I own from after 2000. (I have a few carstock items, and the old plastic ruins from the 90’s). It is a great characterful model. Yours looks great! It’s a nice concept. It reminds me of something Hellboy related for reasons that I can’t quite place, the technoarcana vibe from the start of the first movie perhaps. It’s definitely one of their terrain standouts visually speaking. As Curis mentioned above, it’s surprisingly practical too, with a good deal of space on top for standing figures (including right inside the sphere, which is cute). Excellent! I admire the level of thought you have given to the use of spinning gyroscopes in fantasy tropes; I am slightly ashamed I have never given it the same level of attention. I prescribe a daily hour’s study of tvtropes.com until you can barely tell fantasy from reality any more as treatment.